The whole point of the weekend was to attend the RC annual party for members, as you probably know. However, in true Globe Troffers style, we managed to cram into the weekend all manner of food and dring excitement. The Saturday began with a quite acceptable breakfast at Fernhill Hotel (very good place to stay if you plan a visit to Park Farm) and then a nice 2 mile stroll to Lyme Regis, which looked resplendant in the early autumn sunshine. A fine wander along the front and on to the cob was made perfect by an OK crab sandwich lunch in restaurant overlooking the bay (the view was better than the food I have to say) but Chablis went down well and we all commented on how life can be hard. We squeezed a quick game of crazy golf (really) before a quick scrub up and taxi to RC. Drinks and canapes in the garden was just perfect as the sun slipped behind the picturesque Devon/Dorset hills. The rest of the evening was equally outstanding – although the marquee got very cold due to problems with the heating a splendid evening ensued with the food and drink excellent considering how difficult it is to cater for 250 people in a marquee in the middle of nowhere. Special mention has to go to the Sea Bass Ceviche, grilled sprats, super tender lamb shoulder and the carrots, which were excellent. The local somerset brandy took the lining off my throat though and Stinger (Hugh’s beer) came to the rescue. Julie gave Hugh a kiss and cuddle (as did Dawn I think!) and the evening rolled on with much discussion on wild mushrooms with John. Standing around the bonfire capped it all and we jumped on the trailer to get the taxi back to the hotel. What an absolute cracker of a night!! Well, we could be posting from now until Christmas to cover off this weekend! It was absolutely brilliant. 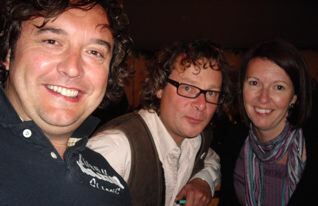 Gurdev, Dawn, Julie and I travelled down to Dorset for the annual River Cottage Members party. 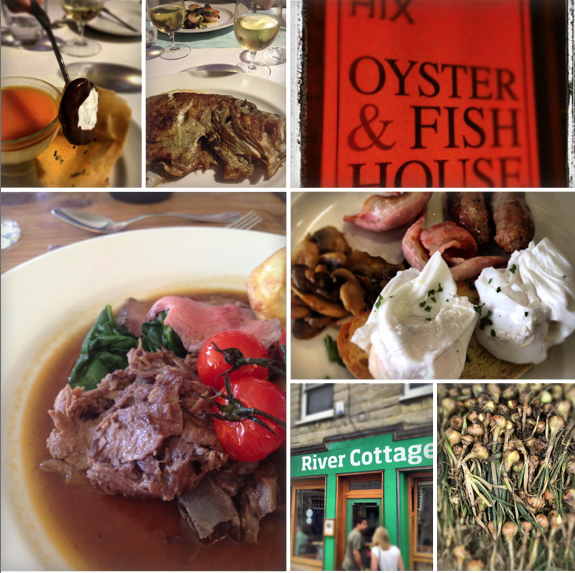 The journey was tortuous to say the least due and it was a race against time to get to the River Cottage Canteen before they stopped serving – and we made it, just! In the sentre of Axminster is the Canteen and you enter on an evening through a deserted shop/del through to the restaurantant at the rear. It felt very unpretentious, down to earth and very real. Bang on Hugh ‘brand’ I’d say. And the food that followed was stunning – simple, great produce cooked simply with great style and a very steady hand. Clearly there is talent in this kitchen too and you could sense Hugh’s hand in everything from the home made bread and butter, smoked cold meats (awesome flavours), fresh picked crab through to the very meaty main courses. 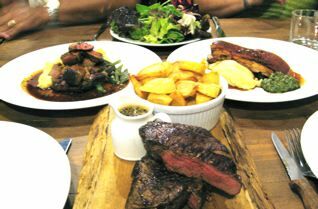 We opted to all share three dishes – shoulder of lamb, pork belly and a double portion of sirloin (wow). It was Julie’s idea to all share and it was a great call. We washed it all down with a couple of bottles of St Emillion (the only french wine on the menu) for me and Gurdev and the girls shared a bottle of white from the Sharpham estate in Devon. As you’d expect, everything was super local and the cheese board was memorable and vast. What a great way to kick off our weekend – more to follow!